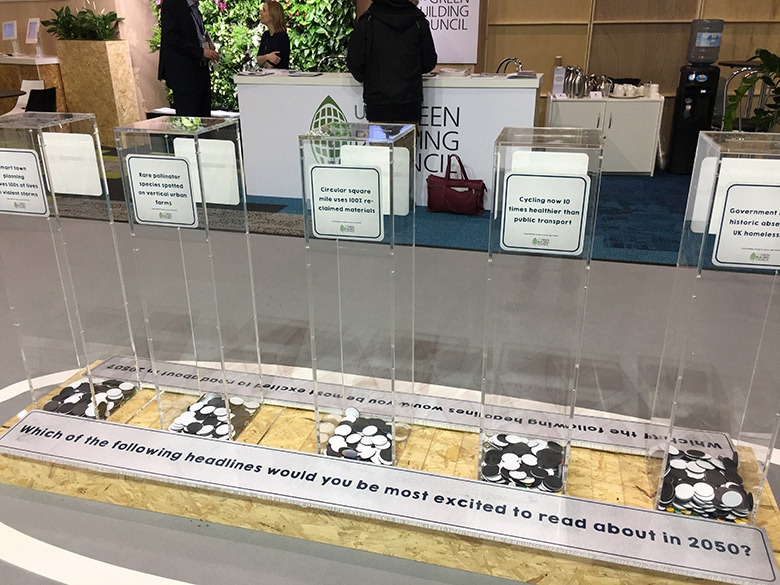 This year at EcoBuild, the UK Green Building Council (UK-GBC) installed an interactive voting system to get people thinking about the flip-side of sustainability. It’s all too easy to lose people when talking about ‘2 degrees of warming’, or ‘400 parts per million of carbon dioxide’, and UK-GBC wanted to change the messaging around climate change to explain how taking positive action today could lead to a better future for us all. To do this they did some futures thinking – which involves imagining future scenarios and then working back to understand what enabling conditions are required from the present day onwards – to come up with five ‘good news’ headlines for 2050. 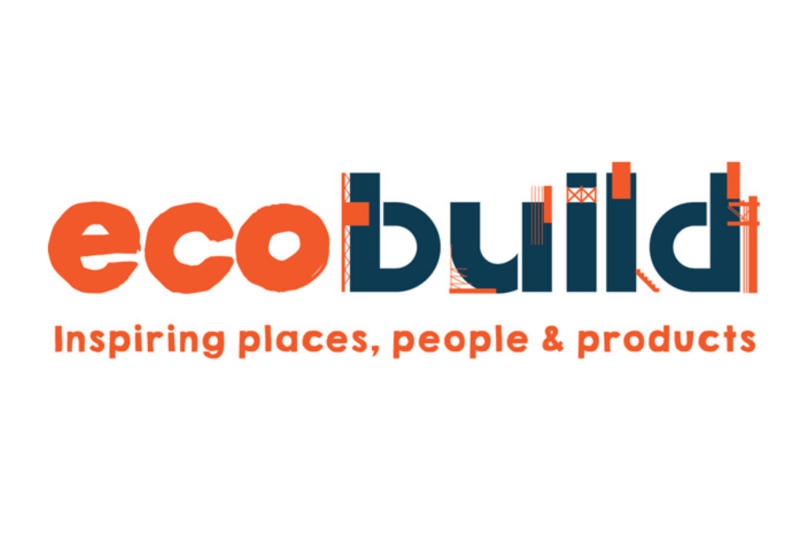 Each of the headlines relates to one of UK-GBC’s core values, which they will be focusing on over the next 10 years as they work towards their vision of a more sustainable built environment. What is your vision of 2050? For the first time in history, people can afford to live wherever they choose. Investment in local and national transport infrastructure, alongside widespread business uptake of remote working technology and local ‘tech hubs’ and of course the government’s commitment in recent years to high-quality house building across the country, mean that we have all but eradicated the historic phenomenon of rough sleeping. Thanks to the climate change adaptation measures implemented over the last 30 years, UK homes are now able to withstand flooding and storms that historically devastated the country. The images of the 2010s where people were driven out of their homes seem barely believable when the technology to provide resilient homes already existed. This latest storm passed over the UK, barely registering, except for slightly higher viewing figures for the 46th final of Strictly Come Dancing. Back in the 2010s, rising air pollution levels in cities meant travelling by bike actually did more harm than good to the health of cyclists. But today, data released by urban air pollution watchdog, WaftWatch, shows that pollution levels are at an all-time low – thanks to the shift to electric vehicles and the introduction of cleantech for domestic heating and industrial processes. This, combined with zero-crash-risk, self-driving cars means that now the only risk cycling has on your health is the chafing of lycra on your inner thigh. This year we have at last seen numbers of bees and other pollinators return to the levels they were at in the 1950s, before they were decimated in the latter half of last century and early part of this one. The national ‘bee-have yourself’ campaign of the 2020s, which saw families across the country planting wildflower seeds in their gardens, together with the urban ‘bee superhighways’, mandated in the 2030s which delivered retrofitted green corridors to link together all green spaces within cities, have made the country pollinator friendly once more. The knock-on effect is a move away from the sky-high pricing of manually pollinated food stuffs which we saw in the early 2030s. In what is now a global experiment of epic proportions, London has been entirely rebuilt using its own existing and reclaimed materials. The ‘Circular City’ is now reborn as an international example of salvaging materials. The UK has always been a world leader in recycling, but has now made the ultimate commitment to reuse, recycle and repurpose. The Mayor of London said “In the Victorian age, London was the first international city and now the story has come full circle”. So what does this tell UK-GBC? While these examples might seem far-fetched, their futures thinking shows that changes of this magnitude, or similar, could be achieved and what the poll results reveal could be key to achieving them. Homelessness and casualties from extreme weather events were the run-away poll winners, and that isn’t surprising, given that they are tragedies we see daily, both in our own lives and in the media. We tend to focus on the issues that are more human and relatable rather than the far-reaching issues for humanity. But what would happen to humanity if the bees all died out? What would happen if we used up the worlds resources? Famine, war, mass loss of life are the startling realities. As an industry, it is key to remember that people will always prioritise issues that impact them directly and it is vital to find a way to communicate the case for a more sustainable built environment in a relatable way.